One of the things that Facebook feeds are good for are links to Yahoo articles that leave you open-mouthed in disbelief. I don't make a habit of reading Yahoo, but a few weeks ago one of my friends posted this bit of news, about a mother who was arrested for letting her kids play outside, unsupervised. I. comes home from school now at around 3:45, and dinner isn't until 5. Most times we do homework and then I'm outside with him for a bit, but sometimes I go in with N. for a few minutes to make dinner, and I let him ride his bike up and down the sidewalk from our house to the corner of the street. It's a distance I think is safe; I can still see him if I put my head out the door, and we have an agreement, which he abides by, that every few laps he'll come stick his head in the door and say hello if he hasn't seen me in the past several minutes. Our street is a well-populated, not very busy suburban street. We know all of the neighbors for two blocks in every direction. I. relishes this freedom, I know ... he goes off on his bike, beaming. I feel like it's a way to build trust; I give him a little bit, and in turn, he appreciates that trust and becomes more responsible. But then things happen, like the horrible tragedy of Jessica Ridgeway, whose body, it was confirmed today, was found, not intact, in a park not even ten miles from her home. To say that my heartfelt condolences go out to the family wouldn't begin to describe how I feel. Jessica's community is in my heart tonight, and I know that tomorrow I will hold my children's hands a little tighter again. I still think that it's important to give our children small freedoms, in order for them to cultivate responsibility. I talk with my son extensively about being safe, and going with people he knows, and staying close to home so that I can see him and yell for him. But at some point, that, too will change. If I'm looking over their shoulders all of the time, how will my children learn to feel independent? So many of the students I used to see at the university where I worked had parents in tow, still looking over their shoulders at age 17. They would come to campus at a moment's notice to stand up for their children, even if their children had been the ones doing wrong, or failing out of school; they would claim that their children were not responsible. And you know what? They were right. Those children were not responsible; that was precisely the problem. On the other hand, how do we make sure that they are safe? We can't, of course. So we do what we can do: we prepare them to live in a world where they can control their own actions, even if they can't control the actions of others. Oh, I didn't know they found Jessica. My heart hurts for her family. It feels like such a hard balance these days: cultivating responsibility and freedom, teaching our children to be independent PEOPLE when they leave our house... but also keeping them safe and well. I don't know that you can ensure safety - just foster their ability to tell when something just feels wrong and teach them how to find safety. Even that doesn't seem enough some days. This is every parents's dilemma. How do we give our kids the freedom they need to grown and thrive and still keep them safe? The reality is why can't always guarantee their safety. Even when we are right next to them at the playground, they can slip and fall and break and arm or a leg. And even when they are playing on our safe street, something horrible can happen to them. There is no way to guarantee they will be safe, and we have to accept that as we usher them into the world. I don't know the answers to your questions, every parent has to find their own comfort zone. As an urban mother who grew up as an urban child that was give free reign to take busses and subways and taxis alone in fifth and sixth grade in one of the singles biggest metropolises in the world, I intend to give my daughter a lot of freedoms within our city. When she is old enough (and I have a feeling I will determine she is old enough before some parents would) she will be able to take the bus home from school or a friend's house by herself. And I'm sure there will be those who thing I'm offering her too many freedoms at too young an age but I will always do what feels appropriate for me, my daughter and my family. I just hope I don't have to be worried about being arrested for my choices. 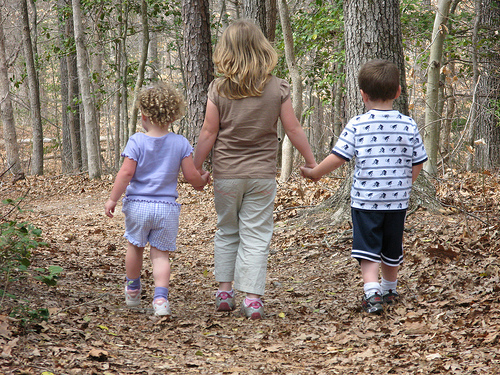 Have you read Lenore Skenazy's blog, "Free Range Kids"? She was excoriated in the media for letting her son ride the NYC subway by myself. @Serenity: "teach them how to find safety." Yes ... and build a community that will create many safe places, too, I think. 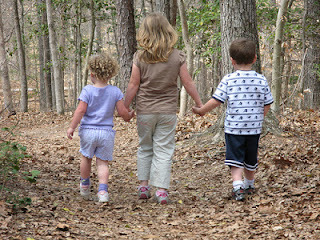 @Esperanza: I think that children who grow up in an urban environment are, by and large, well-equipped to navigate it. And you're right; the freedoms we grant depend at least partially upon the people we are, and the people our children are. @loribeth: FIRST, you are ALWAYS entitled to an opinion here! Sometimes I wonder if we romanticize the safety of the past ... or if parents were really just more permissive? I never got to walk to school, but that was because had to ride with my mom, who taught in a different district. I remember the story about Lenore Skenazy, but never read her blog ... I will have to go check it out! We definatly need to engourage independance in our kids so that they can function highly as adults. but it is a hard thing to do. Munchkin is four and we live in a large townhouse complex with all the mailboxes at the front of the complex and i must admit that i watch munchkin from the top bedroom window whenever she goes to get the mail by herself. I want her to feel i trust her which i do. its other people out there i don't trust. So many people in my community -- both online and physically here -- are asking these important questions. Jessica was EveryGirl; her mom was EveryMom. Could have happened to any of us who ever dare to leave the house. I am talking with my kids about being aware and not afraid. But I'm having trouble heeding my own advice at the moment. I know I'll get there, but for now I'm just broken-hearted. It's important to remember that our children are more likely to be killed in a car accident than they are to be kidnapped by a stranger. Children die in car accidents every day and we don't hear about it. But when a child is abducted we hear about it coast to coast, and we believe that the risk is great when it is not. So we buckle them in and think driving them to school is the safest choice. It's not. I am with you in that I firmly believe it's important - if not ESSENTIAL - ti give our kids small freedoms. WE have to let go a little and if we don't, we are doing them a disservice in that they will never learn to trust themselves or life - but yes, it's scary - very scary at the same time. Esperanza hit the nail on the head about the playground. I fell and broke my arm at the park while my mom was there; my sister fell and broke her arm while she wasn't. You never know what can happen, all you can do is prepare your children for the possibilities when you aren't around. Granting independence is hard, though. Those parents who are still cleaning behind their college kids' ears could just be afraid of losing them, and so refuse to let them go it alone, not being able to accept that independence doesn't preclude needing someone. This is so hard. Things have changed so much since we were kids. Kids need to learn. I will try to give the freedoms that I had, but times change so our ways have to change too. I just want to give them a good balance. This is so sad and so hard to comprehend as a parent. I echo other sentiments and yours in the post in regards to the challenge of balancing giving our children freedom and also trying to reach them responsibility, knowing that bad things can happen no matter what we do. Thank you for sharing your thoughts on all of this.